On Martin Luther King Jr. Day, we have an opportunity to celebrate and honor the many ways that this great American leader stood for peace and justice for all. His work was focused on community, on togetherness, and on brotherhood and sisterhood. The Reverend Dr. Martin Luther King Jr. was an essential leader in the American Civil Rights Movement from the mid-1950s until his assassination in 1968. As a social activist and prominent Baptist minister, King played a vital role in countless civil rights events including the Montgomery Bus Boycott and the 1963 March on Washington. In 1983, the legislation was signed by the United States government to designate a federal holiday on Dr. Martin Luther King Jr.’s birthday– January 15– meaning that non-essential federal government offices are closed, every federal employee is paid for the holiday, and public schools are out of session. Later, in 1994, Congress named this holiday a national day of service. MLK Jr. Day is observed on the third Monday of January each year, near King’s birthday. Because the Reverend Dr. Martin Luther King Jr. was a leader and advocate for freedom and righteousness for all, we can live out his vision by engaging in acts of service. For it is in believing in the potential of our American family and actively building community, that we can grow together in love. As a former co-leader of two community service clubs in Austin-area high schools, I am deeply invested in the power of service learning. I have witnessed, first-hand, the ways that young people are inspired by even simple and small acts of service– from cleaning up local parks to running game booths at a neighborhood elementary school to canvassing neighborhoods for canned foods. In my work as a coach for teens and parents, I often share the idea of finding union and connection through community-based volunteering. As each individual becomes empowered and takes actions, such as volunteering, an openness to working together develops. Additionally, because humans are hard-wired to seek rewards, especially during the teenage years, “doing good” can fill teenagers’ desire to connect, contribute, and be accepted. We have agency in our lives and in our communities. We can (and are responsible for) taking actions to contribute to our families, our communities, and our world. When we actively work towards connected, loving, and healthy communities feels good and helps us understand our role in each of these spheres. As we serve, we can recognize and solidify our identity, our values, and our interests and passions. Working together can warm the heart. As cliche as this sounds, it’s the truth. When we serve collectively, work together, and find synergy we elevate our own energies and the energies of those around us. Connecting with new friends, neighbors, or community members to accomplish a similar goal or through the act of service itself can be uplifting. Community-service presents us with opportunities to grow in empathy; we can begin to more clearly see ourselves in others, relate to others, and sense our connectedness. We can create deep joy by being present. Being in the moment, with those people and spaces in front of us can bring great happiness and even healing. Service means setting an intention to be with others or in action that requires attention, compassion, and love. It is nearly impossible to love without presence, so through service, we can practice mindfulness. Building kinship gives us a sense of purpose and helps us understand our gifts. Moreover, it helps us love and appreciate the gifts of others. When we intentionally participate in community and spend time with others, we are invited to exchange gifts with one another. This reciprocal exchange allows us to relate to one another, to give and receive support, and to deepen our sense of WHY we show up each day. 5. We need to be in community regularly. Humans are not meant to live a completely solitary life; we thrive in tribes or communities and have socially-wired brains. We can realize, through acts of service, the ways we feel supported and nourished by others. We can learn from one another, laugh together, create together, and build community together. This brings us right back to all of Dr. Martin Luther King Jr.’s visions of justice, equality, and solidarity. We are more similar than different. When we sit parallel or work side by side, we learn rather quickly that we have more in common with one another than not. Our connecting helps us internalize the message that we are all one, that we are all equal. Through acts of service we acknowledge our own humanity and the humanity of others; nothing is as humbling and inspiring as seeing yourself in another. We are happier and mentally healthier when we contribute to our community- near and far. Neuroscience shows that altruistic, heartfelt community service activities elicit feelings of satisfaction and reward. In other words, when we “do good,” we feel satisfied, and when we feel satisfied, we experience a rush of pleasure hormones similar to those released by eating sugar or earning money. What other life lessons have you learned through service and volunteerism? Join me in making the pledge to spend this MLK Jr. Day doing service in your local community! You can also search for and register your MLK Jr. Day event. Finally, I reccomend spending time researching events and ways to serve with your children and family. If you’d like support in this process and in developing service learning conversations in your home, e-mail me. 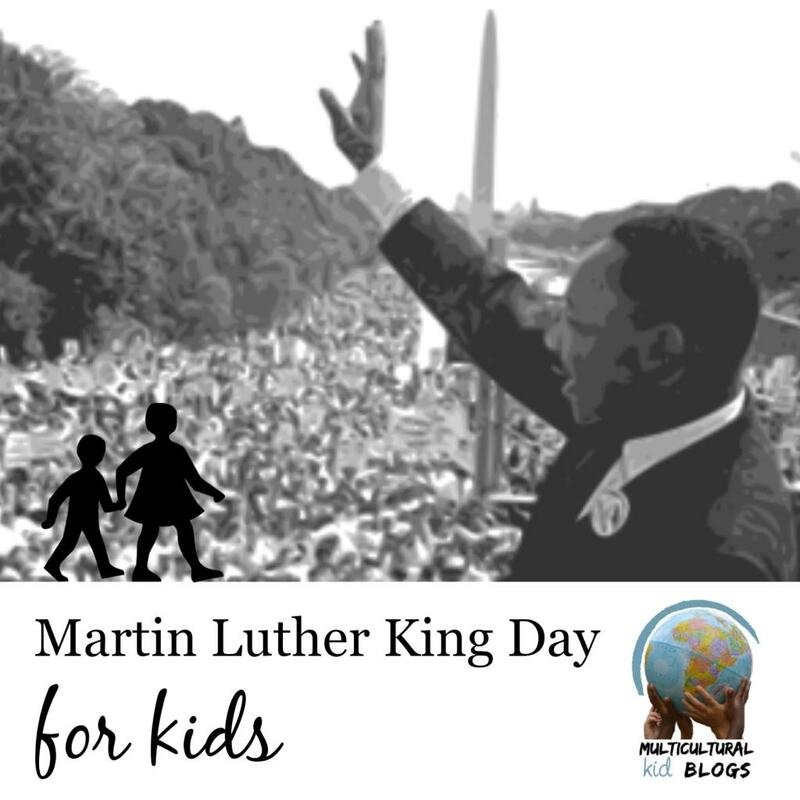 Welcome to our fourth annual blog hop on Martin Luther King Day for Kids! Find great ideas for commemorating MLK Day with kids and don’t miss our series from last year as well as 2016 and 2015! I LOVE this post! King was so inspirational and I love how you shared the benefits of following his example. It’s so important for our world to change for good rather than focus on divisions. I’m so glad that this post resonated with you! It feels powerful and so important to take steps to honor our leaders who have taught us love, justice, and equality! So inspiring! I truly believe in the power of volunteering, being in service to others who truly need it is awesome, every time I participate I ended up filled with love and life learning lessons. I´m not from the US but have always recognized MLK as a great leader. Thank you for sharing your perspective, especially as someone who does not identify as American. MLK Jr. and his mission has touched so many! Americans are especially independent-minded and live for a community of one. This is a good way to experience and prioritize community. Good post! Yes, building community is crucial! So glad you enjoyed this article! Excellent post. These are the values we try to instill in our children. We volunteer as a family. I’m so glad this post resonated with you! And that you prioritize volunteerism! What an excellent post! I love the idea of finding ways to volunteer! I’m so glad you enjoyed this article! It has been a joy in my life to serve, especially with children! Have fun!